The M-CUBE research project is coordinated by Aix Marseille University (AMU) and led by the Fresnel Institute and the Center for Magnetic Resonance in Biology and Medicine (CRMBM). M-CUBE has been selected by the European Commission and is funded for 4 years from the 1st of January, 2017. M-CUBE project, entitled MetaMaterials antenna for ultra-high field MRI, is laureate of the “Future and Emerging Technologies-OPEN-1-2016-2017” European call for project. The FET-OPEN call is one of the H2020 programme’s most competitive calls. The success rate in the “Research and Innovation Action” category of this call is 4%. Only 22 projects have been selected from a total of 544 applications at the European level. It is worth noting that among the 22 laureates, 4 projects are coordinated by French universities. FET-OPEN calls aim at funding collaborative projects from first class consortia that propose novel ideas for radically new technologies. AMU coordinates the M-CUBE consortium which gathers 8 world-class academic actors and 2 very promising SMEs. 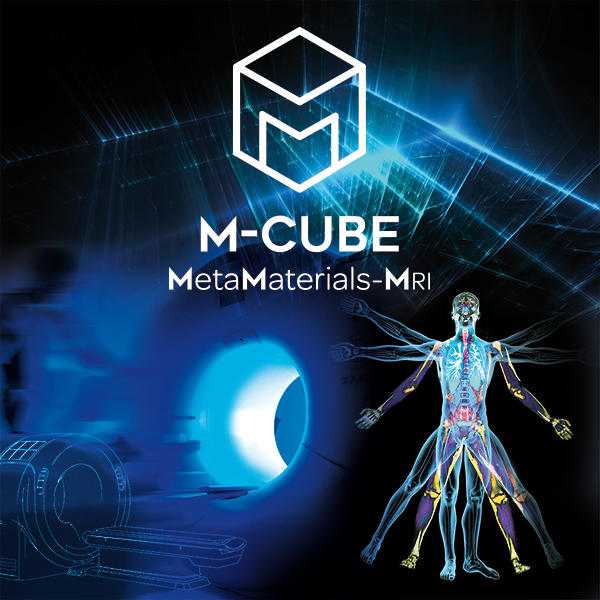 M-Cube aims at changing the paradigm of High-Field and Ultra High-Field MRI antennas to offer much better insight of the human body and enable earlier detection of diseases and conditions. The main objective of the project is to go beyond the limits of existing clinical imaging using an MRI scanner and radically improve spatial and temporal resolutions on image quality. Indeed, current clinical use of High-field and Ultra High-Field MRI scanners is constrained by the lack of homogeneity of the resulting image and by constraints related to the Specific Absorption Rate (SAR) of the Radio Frequency (RF) fields associated with the magnetic resonance. To date, methods used to tackle image inhomogeneity and high SAR levels involve increasing the number of active RF antennas, which in turn renders these solutions both complex and expensive. The M-Cube solution relies on innovative systems using passive metamaterial structures to avoid multiple active elements. These systems are expected to make High-Field MRI fully diagnostically relevant for physicians. To achieve these results, the M-Cube consortium will develop a disruptive metamaterial antenna technology for high field and ultra high field MRIs. Physicists, medical doctors and industrial actors will work closely together for the duration of the project to create a “patient-centered” solution that will pave the way for more accurate diagnostics in the context of personalized medicine and will enable the earlier detection of diseases and other conditions. M-CUBE Scientific leaders are Dr Stefan Enoch, Fresnel Institute Director, and Dr Redha Abdeddaim, Professor IUT AMU-Institut Fresnel.